Want to discover the must see landmarks and tourist attraction your city or town has to offer? Maybe your visiting from interstate or internationally and after tours that will let you discover the hidden gems you might not know about. Our range of tours and attractions offers you diverse experiences that truly show off the unique character of this country’s regions and its majestic, picturesque landscape. Discover all the amazing New Zealand activities on offer at RedBalloon today. Ticking off some of our New Zealand activities are some of the best ways to see and experience everything this country has to offer. There are plenty of must-do things when visiting NZ, or simply exploring your local city, and with a RedBalloon experience, you’ll see the country’s best tourist attractions, cities and historical Maori culture. Discover plenty of tours and attractions across the country’s major cities from Auckland and Rotorua, to Christchurch and Queenstown. 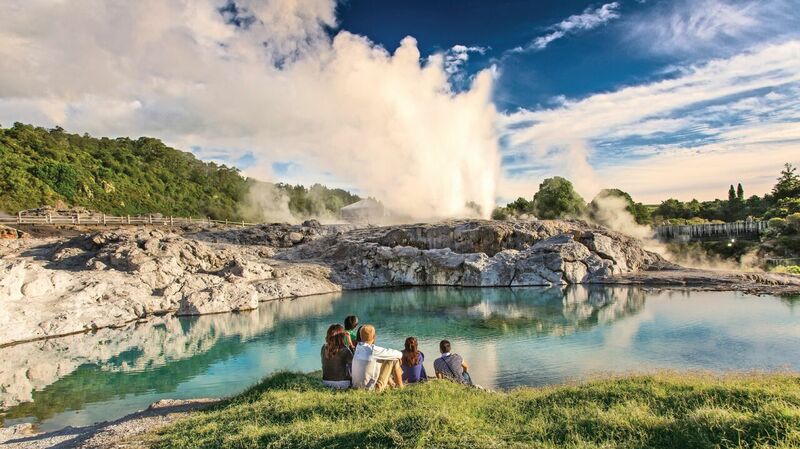 You’ll find a range of experiences across animal encounters, segway tours, Hobbiton tours, cruises, geothermal activities and volcanic experiences, scenic tours plus plenty more. You’ll never be stuck trying to think of amazing activities to do in your city or the must see tourist attractions if you’re travelling around the country. What activities can you do in New Zealand? Whether you’re visiting NZ from overseas or travelling interstate, you might be wondering what activities you can do. There are plenty of things to do in New Zealand so let's break it down to the experiences located in both the North Island and South Island. If you’re looking for tours and attractions on the North Island there are plenty of must do experiences depending on where you’re travelling. Find tours of Auckland, Bay of Islands, Northland, Rotorua, Bay of Plenty, Hamilton and Waikato, Wellington, Hawke’s Bay and more. Jump on board one of the many cruises and boating adventures available around the North Island to explore the area in the most majestic way possible. Whether it’s hitting the sea in a catamaran sailing around Lake Taupo, sightseeing Auckland Harbour on a cruise, visiting Bay of Islands with a cruise and snorkelling package or exploring Tauranga on a full day wildlife boat tour, there a plenty of activities to do in the North at sea. This Island is also home to an active Volcano which means that visiting this attraction is a must do experience. The live marine volcano tour of White Island includes a guided tour, exploring up close the hissing and sulphuric bubbling inner crater of this unique and volatile landscape. It’s worth ticking off this live Volcanic experience from your bucket list even if you’re a local to the Bay of Plenty region. Another popular activity our customers love to do in the North Island includes the Weta workshops. If you’re visiting Wellington or simply looking for things to do over the weekend, one of our Weta experiences is the way to go. You’ll enjoy a behind the scenes tour of the studio where physical effects for The Lord of the Rings trilogy, Distrust 9, King Kong and more were made. You’ll get up close to movie memorabilia, props and collectibles and hear what it is like to create these for big Hollywood movies. These are some of the films that put NZ on the map and is one of the best sightseeing tours for all the movie buffs out there. Looking for New Zealand tours in the North that are perfect for kids to enjoy too? The Zealandia Wildlife Sanctuary day trip is perfect for the whole family to enjoy and a renowned tourist attraction in Wellington. You’ll explore this iconic wildlife sanctuary with an expert guide and learn about the abundance of birds, reptiles and plant species all whilst soaking up the calmness of this picturesque location. Soak up the beautiful scenery while learning more about New Zealand’s unique ecological history. There are plenty of adventure tours and things to do on the South Island of the country. Home to Queenstown, Milford Sound, Christchurch, Hanmer Springs, Marlborough, Nelson and Abel Tasman and so many more wonderful places. There are plenty of must do activities to enjoy whilst visiting the South Island or if you’re simply after NZ tours to keep you entertained. Take in the picturesque landscapes of the island with a bike tour. From a trail ride with winery tour and lunch in Gibbston Valley, a bike tour of Arrow River, Queenstown trail bike tour with lunch and a guided ride, it’s one of the funnest ways to explore the area and not to mention you’ll keep fit at the same time. When you’re visiting South Island there are also plenty of scenic tours to enjoy including cruises and boat trips. Step on board Queenstown’s famous vintage steamship, take in the beauty of Milford Sound with a nature cruise, explore the Abel Tasman with a cruise and forest walk or tick off a nature cruise at Akaroa Harbour from your list. There are plenty of New Zealand tours, especially in the South Island, that will let you discover the beauty of the country from the water. Why not explore the Island with one of our New Zealand tour packages that are a little more fun and unique. A segway tour or kayaking adventure are some of the best ways to see the sights and attractions of a city. Jump onto a segway and learn about a city and its culture in this futuristic tour you won’t forget. If you’d prefer to hit the water, a kayaking tour will provide panoramic views of the Southern Alps and glaciers that will take your breath away. What are the most popular tourist attractions of New Zealand? We’ve pulled together the most popular tourist attractions of New Zealand. These are types of experiences that should be added to your to do list if you’re visiting from overseas, traveling interstate or if you’re after activities that will let you explore your own backyard. Hobbiton Movie set tour: this is an experience we recommend not only to movie buffs but also those who are fascinated in exploring what New Zealand is famous for around the world. We offer plenty of guided tours and day trips that will allow you to discover the real Middle-Earth at the Hobbiton Set near Matamata. You’ll see the Hobbit Holes, Green Dragon Inn, The Mill, the double arched bridge and more at the film set for the Lord of the Rings and The Hobbiton trilogies. If you’re ever wondering what to do in New Zealand, this is definitely our number one tour. Milford Sound: located in the South Island, this fiord is known internationally for its beauty and breathtaking rainforests, waterfalls and habitat. There is no better way to discover this place then with a cruise. With a nature cruise, you’ll take in the spectacular views including seals, dolphins and penguins which will create plenty of photo opportunities. This tourist attraction is a once in a lifetime experience that should definitely be ticked off your bucket list, especially if your kiwi local. Rangitoto Island: exploring the volcanic terrain of this Island is one of the best New Zealand tours and attractions to tick off your list. Departing from Auckland, enjoy a ferry ride and half day guided tour which will include 360 degree views of the water and city skyline after a short walk to the island’s summit. This scenic tour will provide spectacular sightseeing opportunities and leave you wanting more.